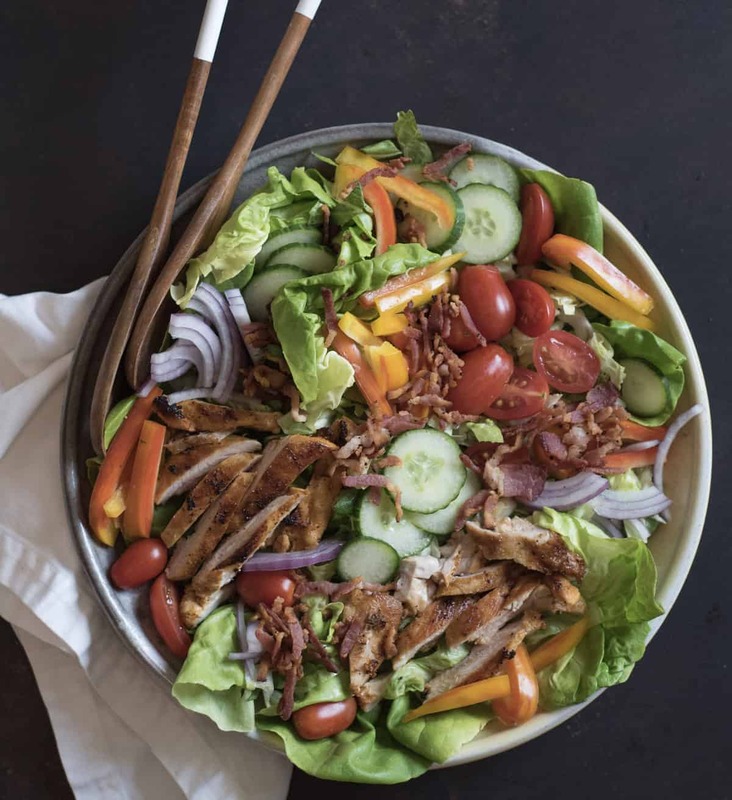 The BEST Chicken Bacon Ranch Salad of summer is a main dish green salad topped with all of your favorite things, such as pan-seared chicken, bacon, tomatoes, cucumber, and plenty of ranch dressing! Today I’m working with Litehouse Dressing and I have created an amazing, simple, quick meal your whole family is going to go crazy for. Are you making main dish salads for your people yet? I was so sure for a few years that they wouldn’t eat a salad for dinner, so I didn’t make them. Now I’m regretting taking so long to try because my family loves hearty main dish salads. I love them too. They are easy to make (this recipes comes together in about 30 minutes, but if you were to prep most of it on a meal prep day then it would literally take 5 minutes to get on the table). 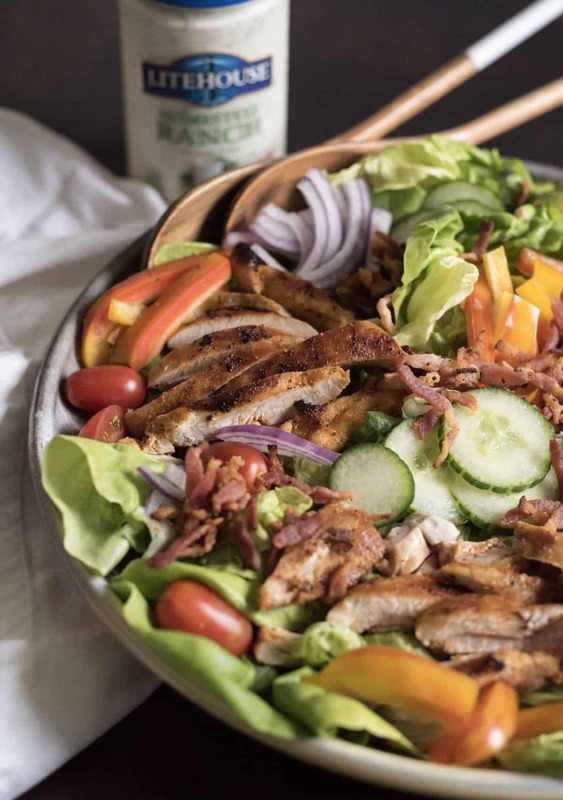 This Chicken Bacon Ranch Salad was a huge hit because of those three main words: chicken, bacon, and ranch. My kids can totally eat the mixed-in vegetable when those three other things are involved. Their only request for this salad – add croutons next time (and I want to add some avocado!). 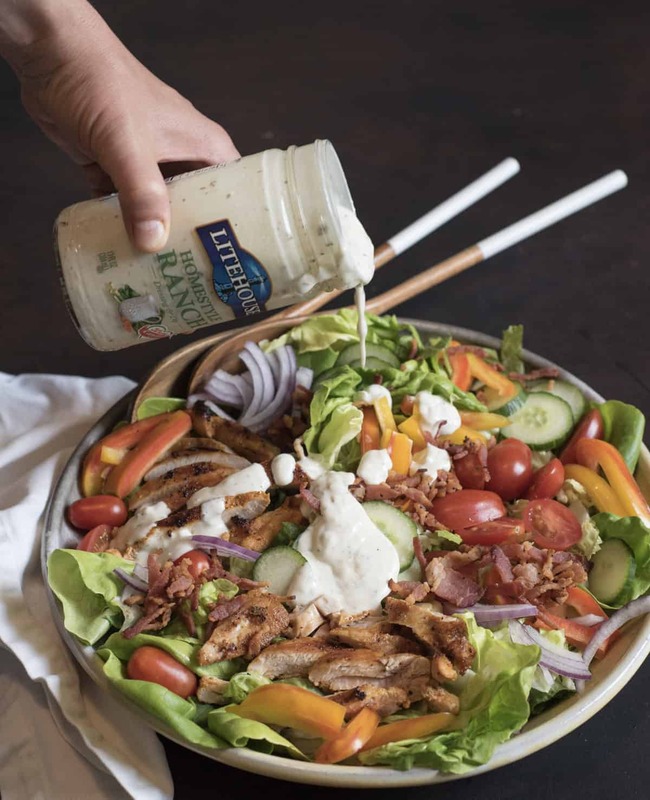 Litehouse Homestyle Ranch Dressing is one of our all-time favorite dressings. We eat it on pizza, salads, and everything in our veggie box. My baby even likes to dip pickles in it! When you shop for produce, you don’t shop in the condiment or baking aisle. You head to the refrigerated section – where mouth-watering fresh veggies are brimming with color and flavor. That’s where you’ll find Litehouse – fresh, refrigerated, and delicious dressings. You can prep everything ahead of time. Chop all of those veggies and cook that chicken on your prep day and then just assemble and eat! I love using chicken thighs for this recipe; they stay so moist and are full of flavor. You can definitely use another cut of chicken if you’d like; just don’t over cook. This recipe is great with a side of seasonal produce (watermelon, cantaloupe, peaches, berries…) and some kind of starch/carb like corn on the cob, bread sticks, or a loaf of that super easy no-knead bread that we love. Litehouse Homestyle Ranch Dressing is a must. Find it in the refrigerated section (near the produce). 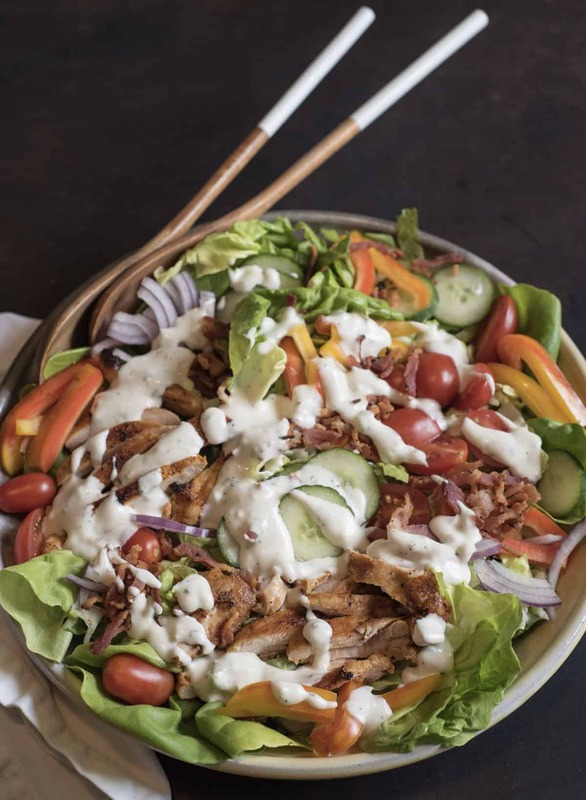 The BEST Chicken Bacon Ranch Salad of summer is a main dish salad topped with all of your favorite things, such as pan-seared chicken, bacon, tomatoes, cucumber, and plenty of ranch dressing! In a large zipper-topped plastic baggie or a shallow dish, add the chicken, all of the spices, lime juice, and oil. Close the bag and use your hands to mix everything together. If you are using a shallow dish, use tongs to work the spices evenly into the chicken. You can let this rest for up to a half hour or work with it right away. I like to let it rest a minute to increase the flavor. Heat a large skillet over medium to medium-high heat. When the skillet is hot, add the chicken. Cook for 13-15 minutes, turning once, until the chicken is cooked through. Remove the chicken from the pan and let it rest for 10 minutes. While the chicken cooks, add your salad greens to a shallow serving bowl. Top with tomatoes, bell pepper, bacon, cucumber, and red onion. When the chicken is cool, slice it into thin strips and add it to the salad. 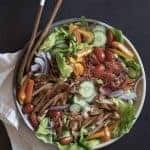 You can dress the salad with Litehouse Homestyle Ranch Dressing before serving or have everyone serve themselves and then dress as they like – it’s up to you. This is a great meal to prep ahead of time on your meal prep day! Then when it’s time to eat, you are literally going to put everything together and serve. So easy! Even if you aren’t prepping this ahead of time, it should only take about 30 minutes to get on the table. You’ve got to love that! Enjoy this delicious, fresh, simple meal from my kitchen to yours! Long live all the chicken, bacon, ranch things! This is a sponsored post written by me on behalf of Litehouse Dressing. Thank you for supporting the brands that help make Bless this Mess possible.